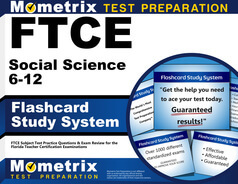 The FTCE Social Science 6-12 Exam is computer-based, and one that consists of 120 multiple-choice questions. You will be allotted 2 hours and 30 minutes the complete the exam. For examinees with conditions that are covered under the Americans with Disabilities Act (ADA), you are allowed to request special accommodations. Some of the requirements that can be accommodated include longer testing time, provided with a seat cushion, Braille test materials, and the ability to take prescription medication outside of regular breaks. What subjects will be tested on the exam? What percentage of questions are there for each subject? The subjects that will be tested include the understanding of geography, economics, political science, world history, U.S. history, and social science and its methodology. The 10% of geography questions will focus on topics such as six essential elements, analyzing information from maps, and determining how natural processes and human-environment interactions affect Earth as well as cultural features. The 15% of economics questions will focus on topics such as identifying economic systems, understanding supply and demand, and the functions of budgeting and saving. The 15% of political science questions will focus on topics such as U.S. state and local governments, U.S. Citizenship, and effects of U.S. foreign policy. The 25% of world history questions will focus on topics such as knowing the qualities of prehistoric cultures, analyzing the social, economic, and political effects of the Industrial Revolution, and understanding how political transformations and armed forces conflicts affect the 20th century. The 25% of U.S. history questions will focus on the Age of Exploration, and westward expansion. The 10% of social science and methodology questions will focus on various social science disciplines, social science concepts, and strategies of teaching social science. What is the most convenient way to register for this exam? If you have not already done so, you will create an account online and register there. You will have the opportunity to select the location and date of your exam. The first time you take this exam, your fee will be $200. If you take this exam more than once, due to not passing, you will pay $220 each additional time. There are various testing locations throughout Florida, and other states within the country. Once you have located the site at which you would like to take the exam, you can make an appointment to do so. The first bit of advice, is to make sure you arrive on time to the testing center. Getting there at least 30 minutes early is even better, as getting there late may cancel your opportunity to take the exam at the scheduled time. Proper identification is required to be allowed to take the exam. This identification must not be expired. Two forms of ID are required. The first should have your name, signature, and photo. At a minimum, the second form of identification must consist of your name and signature. Be aware of items that are not allowed in the testing area, such as a purse or cell phone. You will be provided with an unofficial report that says “Pass” or “Fail” before leaving the test site. Additionally, approximately four weeks after testing, you will receive your official score report. What minimum score do I need to pass the exam? A scaled score of 200. You can re-take the exam. There is no limit to how many times you take the exam in order to pass it. At Mometrix, we are bold about our claims of what our study materials can do for you because we know how hard we’ve worked to give you the best. 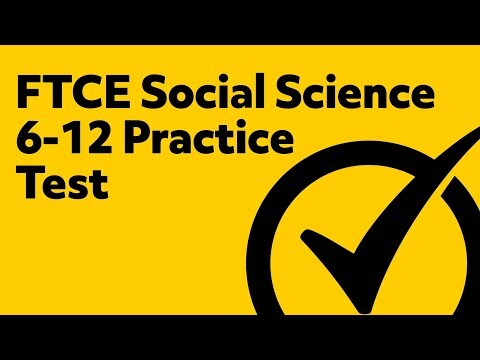 Our definition of the best is not a good enough score to pass the FTCE Social Science 6-12 Exam, it is a score that not only passes the exam, but one that sets you apart from other test-takers. Don’t just listen to our words, find out for yourself. Visit our study guide and flash card sites to get yours. Mometrix Academy is a completely free resource provided by Mometrix Test Preparation. If you find benefit from our efforts here, check out our premium quality FTCE Social Science 6-12 study guide to take your studying to the next level. 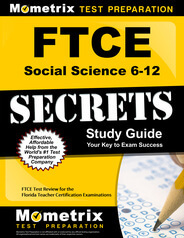 Just click the FTCE Social Science 6-12 study guide link below. Your purchase also helps us make even more great, free content for test-takers.